Runner. Ultra Marathoner. Mom. Crusader. “I didn’t like when people looked at me like I was sick or weak when I was diagnosed, so I decided to do something about it,” said breast cancer survivor Daveny McNaney. Three months after surgery following her diagnosis in 2012, the mother, now 44 years old, started running again — first in a 5K and then in the Detroit half-marathon. And, eventually she got back to full marathons and more. 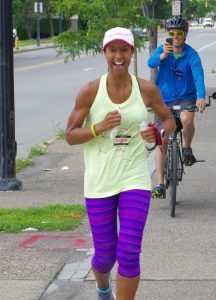 Now she runs more than 1,300 miles a year to raise money for breast cancer research. Click here or here to read more about Davina.